Vast Public Indifference: 101 Ways, Part 89: "Laid His Hoary Head to Rest Beneath This Mournful Turf"
101 Ways, Part 89: "Laid His Hoary Head to Rest Beneath This Mournful Turf"
For a brief intro to the "101 Ways to Say 'Died'" series, click here. I've been to Newburyport many times, but I have never seen this stone. 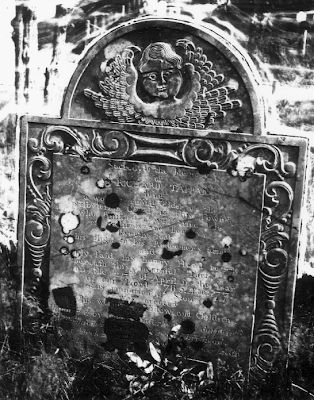 The folks over at A Very Grave Matter don't have a picture of it either, which leads me to believe that it may no longer exist. If that's true, it's too bad — it looks like a beauty. This picture is from the Farber Collection. Its low quality suggests that the photgraph was not taken specifically for the Farber Collection — it may be an older picture that was included because the stone was damaged or destroyed. There are actually several ways to say "died" in this lengthy epitaph — take your pick. of our Lord 1785 AEtat .77. Labels: 101 Ways to Say "Died"